GourmetKickz is the world’s best custom foamposite designer. Chef cooks up customized foamposites like no one else with details and themes that boggle the mind. Penny Hardaway himself commissioned Chef to create him his own customized Foamposite Ones. 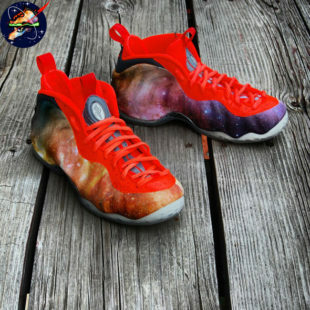 When searching the internet for custom foamposites it is hard to not run into a design by GourmetKickz. Chef was one of the first custom sneaker artists to successfully customize a foamposite one. After a short period of time GourmetKickz series of custom foamposites had become so well known that Penny Hardaway himself reached out to Chef to have foamposite designed. This would be the equivalent of Michael Jordan contacting a custom sneaker artist to have a Jordan Retro designed. In fact the custom foamposite that SoleCollector identified as being the #1 Best Custom Foamposite from their list of 50 top designs was the very Oxidized Patina Penny Foamposite that Chef made for Penny Hardaway. The design itself was genius, it perfectly represented the basketball icon and his signature sneaker. A gracefully aging Copper Penny, gathering patina (copper oxidation) and looking all the more beautiful and iconic for it. It is this type of well thought out design and thorough understanding of the Foamposite One as a canvas that has allowed Chef to consistently design some of the most well known and beautiful custom foamposites in the world. From the Hattori Hanzo Foamposite, to the 305 Foamposites, to the ParaNorma-Likes, to the Zombie in South Beach, and so many more. The GourmetKickz brand name is synonymous with top of the line custom foamposites. Click through the selections above and see for yourself.